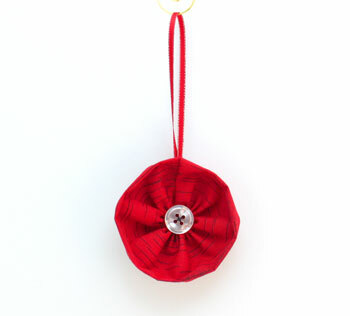 The Fabric Flower ornament takes a small piece of fabric, a short piece of ribbon and a button to become a fun and easy decoration using basic sewing stitches. 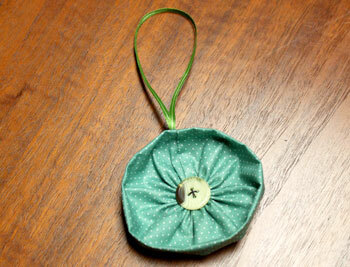 The Fabric Flower Ornament is "sew" simple to make. 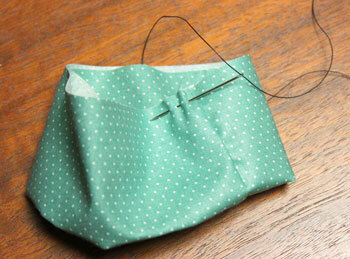 Let's make one using a green dotted fabric. Cut the 4-inch by 10-inch rectangle of fabric. Cut the ribbon 10 inches long for the hanging loop. Thread the needle and add a knot in one end of the thread. I used a single heavy-duty craft thread. If you're using all-purpose thread, use two-ply. This project uses the basic running stitch. It's a fast and easy stitch. If you would like more help with the running stitch, go to the funEZ How to sew stitches page to get your own free e-book. Fold the fabric in half lengthwise with right sides together. Begin sewing running stitches 1/4-inch from the raw edges. Tie a knot in the thread close to the fabric. 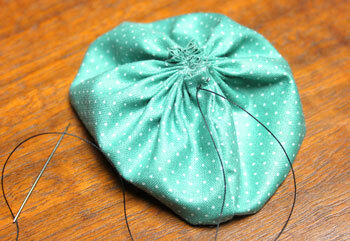 Fold the fabric in half around the circle with the wrong sides together. Tie a knot in one end of the thread. 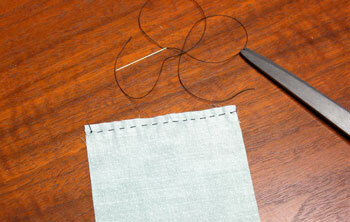 When you pull the needle, leave a two-inch tail of thread at the starting point. Continue the running stitches until the circle is complete. Pull the ends of the thread to gather the center of the circle. Tie the ends of the thread together to hold the gathers in place. Cut the short end of the thread, but leave the needle end of the thread attached. Position the button on the front of the circle. 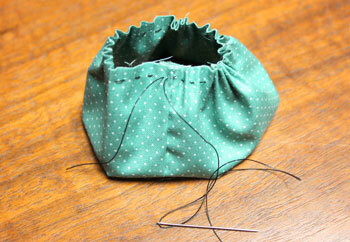 Push the needle through the fabric from the back and through one of the button's holes. 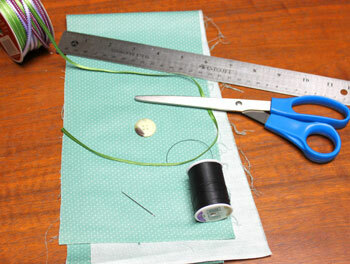 Continue sewing the button with at least two stitches through each set of holes. 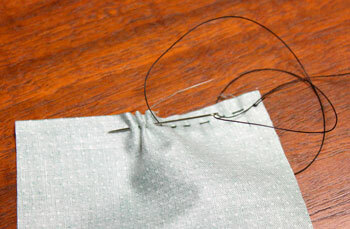 Push the needle to the back, add a knot in the thread close to the fabric and trim the thread. Fold the ribbon in half to form a loop. Position the cut ends over the seam on the back of the Fabric Flower Ornament. 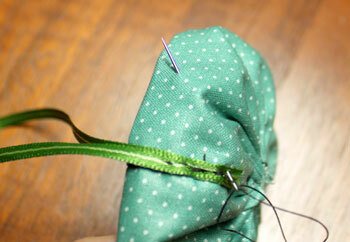 With a knot in the thread, begin stitching the ribbon to the seam. Make sure the needle does not go through all layers of the fabric and show thread on the front. 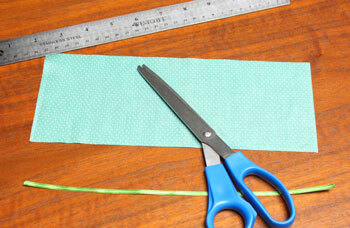 Make several stitches to secure the ribbon loop to the seam. Make a knot close to the ribbon. Push the needle between the fabric layers to hide the end of the thread. Cut the thread near the fabric being careful not to cut the fabric. 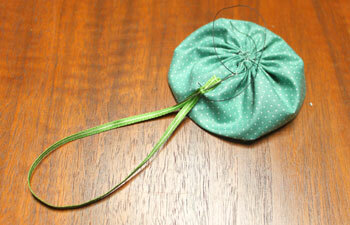 Make a cupped flower shape with the gathered fabric. The Fabric Flower Ornament is finished and ready to hang on display. 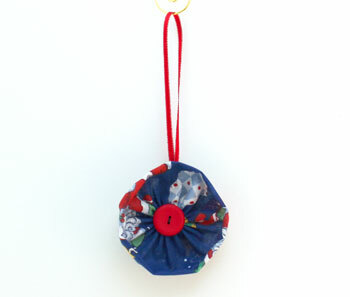 A fabric scrap, a piece of ribbon and a button quickly become a fun ornament. Make them simply with fabric scraps or design a whole color scheme with new fabric-perhaps a shiny taffeta or similar woven fabric. Just make sure the fabric will hold the shape. Have fun making one, a few or many! 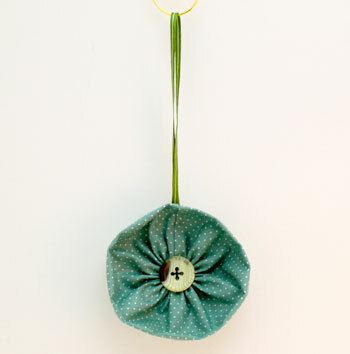 The Fabric Flower Ornament is a fun and easy sewing project for either novice or experienced sewers.